Last year a new client came to HPS to enroll a gorgeous new contemporary home into our Stewardship program. During our start-up inspection we were startled to find a BBQ island on the back patio that had caught fire and burned. When asked about the fire our client reported that during his first cookout, the island had simply burst into flames. The expensive stainless BBQ was ruined, and its supporting base cabinet was a total loss too. 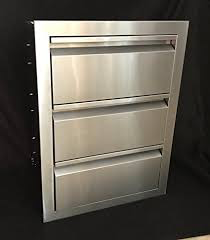 Every built-in BBQ, especially if the counter boxes are built with a combustible material, should be installed with an insulated metal grill liner. This is a kind of protective metal jacket for your grill. Many outdoor kitchens have gone down in flames solely because an insulated grill jacket was not installed with the grill. Insulated grill jackets surround the BBQ and prevent heat from transferring into the cabinet structure. These devices will prevent any melting, burning, warping or fires. The jackets also provide the additional benefit of supporting and protecting your grills undercarriage from premature weathering and corrosion. Many designers leave these protective liners out of the plans either because they don’t know about them, or they dislike their appearance. Cumbersome looking or not, they are an absolute necessity when building your outdoor kitchen with or without any combustible materials. Installing an insulated grill jacket will ensure your outdoor kitchen will last for many years of cookouts. NOTE: Not all BBQ brands offer these protective liners for their appliances. Make sure you purchase your grill from a brand that does, or plan to have one custom made for your application. The BBQ cabinet box was not fitted with vent panels. When using a natural gas or propane BBQ, the enclosure cabinet must be properly vented to prevent an accidental explosion. During construction, the proper placement of the vents is critical. 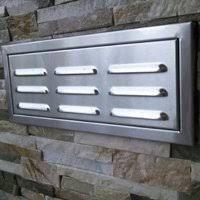 Install vent panels every four feet along the length of the structure to prevent any possible leaking gases from building up. The type of gas you are using will dictate where each vent panel is installed on the cabinet. If using natural gas (NG), make sure to install each vent panel as high as possible on the body of the island because natural gas rises. When using propane (LP), make sure to install the vents as low as possible on the cabinet since propane is a heavier gas that sinks. Always use a licensed contractor who knows the codes for natural gas and propane installations. You might save a few bucks by attempting to do this yourself, or leaving out the proper vents entirely. But you could also end up having to replace your entire outdoor kitchen, or home, or possibly seriously injuring someone. Having drawers in your outdoor kitchen cabinets can be very useful, but always consider the placement layout beforehand. Many outdoor kitchen owners purchase drawers units for the cabinets, then realize they need to have access for plumbing. This is also a common issue with grills because the gas or propane plumbing requires access. When planning your outdoor kitchen, think carefully about the placement of your doors and drawers, and whether or not you can install appliances in the given space. Instead you may just want to use access doors that open into the existing void space of the island structure. Make sure the cabinet and appliances are outdoor rated. When equipping your outdoor kitchen, buy only appliances that are rated for exterior use by the manufacturer. Outdoor units are “hardened” to insure safety and durability when exposed to harsh weather. Indoor appliances are just not up to an environment that may subject it to humidity, heat, cold, blowing sand, rain, rodents and sunshine. In very short order, using indoor appliances outdoors will lead to problems. The appliances finish will become discolored or the unit may fail completely. You can be assured that your warranty will be nullified. It is also a good idea to order a custom cover for the entire countertop. This will protect it from the elements when not in use or during the off-season. 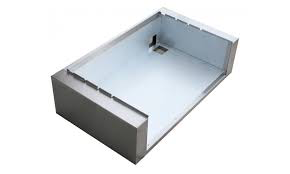 Outdoor cabinets and enclosures also need to be constructed ideally of steel or concrete in order to remove the possibility of dry rot, fire or rodent access. You can order pre-fabricated outdoor kitchen cabinets from Amazon here. Or here. Never install your cooking and cooling appliances next to each other. 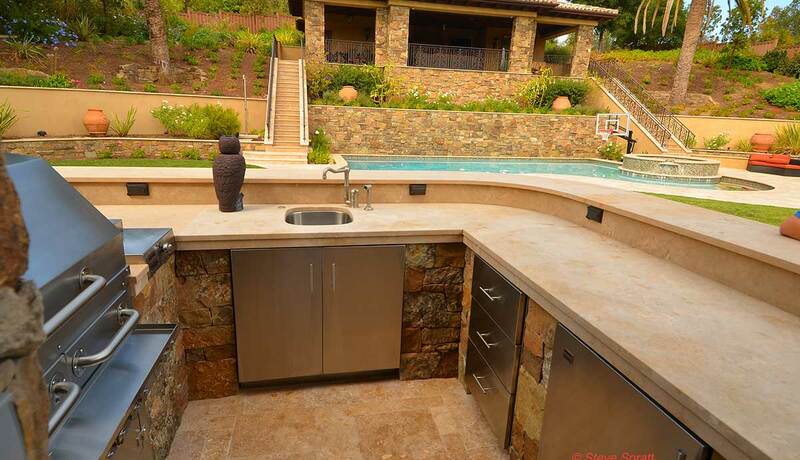 When designing an outdoor kitchen always separate the cooking appliances from the cooling appliances. Never install a refrigerator directly underneath or adjacent to your grill. Excessive heat means the refer will have to work much harder than it should. Overheating the internal parts can easily become a cause for them to fail sooner. If space is tight, install your refer at least one foot from your grill or side burner. Make sure a solid barrier is placed between the two appliances inside the island structure. A good layout will help your appliances operate at a reasonable temperature and as a result, last longer. For safety purposes, design to prevent people from using the refrigerator with close exposure to the hot grill, either directly, next to, or above them. Know your appliances dimensions before making cut-outs. It is frustrating and expensive to have your cabinet spaces or countertops pre-cut for your appliances, only to find out they do not fit when it’s time to install them. Double and triple check the exact dimensions for the built-in pieces before making any cuts. If possible, it is always best to have the actual products on-hand to measure them for accuracy and a good fit. If you are using a stone slab countertop make sure the top fabricator templates the area just like they would for the kitchen. The rule of “measure twice and cut once” is especially important when working with stone. Don’t forget to leave some extra counter space. Like most homeowners, you likely want to deck out your new outdoor kitchen with all sorts of appliances, for all kinds of cooking drink mixing and entertaining. However, not many appliances actually are rated for outdoor use. Mixers, coffee makers, microwaves etc. can all be ruined by a surprise rain, an errant sprinkler or even a heavy dew. So don’t leave these non-rated appliances outside. Also, in all the excitement don’t forget the importance of empty counter space. It is best to leave plenty of empty counter space for things like food preparation, serving, eating and staging. When designing your outdoor kitchen, make sure you leave plenty of work space on the countertop for easy and convenient use. There are tons of outdoor appliances on the market and it can be hard to choose the perfect products for you. Everyone wants great looking and functional appliances, but the important characteristic is durability. For that reason, its most important to do your homework before buying. An outdoor kitchen is something you want to last for many years, so it is crucial to select the perfect appliances when building. Avoid the mistakes discussed above when designing your outdoor BBQ kitchen. Take time creating a good appliance layout. Read over any available customer and expert reviews. Research how well the appliance performs and only select products that are made for the outdoors. By doing your research beforehand, you will be much happier with your choices in the years to come. See How to Buy a BBQ. Contact me at info.homepreservation.com if you would like more information about planning and and constructing a quality outdoor kitchen area. Congratulations on taking time to use this free website. I truly hope you find the information here fun and useful? Please send me your comments and feedback. Writing and maintaining this site is a lot of hard work. By sharing these pages with your friends, you help me to continue the effort. You can easily share these pages to all your favorite social media sites via the shortcut buttons on the sidebar. You can also simply email the page link to your friends. Please share often. The very best way to help me occurs when you use the embedded links to buy things. Using a link is easy and free, yet it provides a great source of support for this site. The vendors I’ve chosen to link to have proven to be the very best resources available so that is why I recommend them personally. If you have questions or just want to say hi, please send me a note. Study shows preventive maintenance efforts return high yields. Is maintenance really worth the effort? Does preventive maintenance make money? No matter how obvious some things appear, often these same things remain very difficult to prove. Consider the simple act of taking care of your stuff. At a gut level we all understand that if you take care of an object, it will last longer. But how much longer will it last? If it lasts longer, what is the value of that? How much extra does it cost to take care of an object versus not? Until now the economic value of preventive maintenance has been elusive to prove because it has been difficult to both study and calculate. Now a long-awaited study published by Jones Lang Lasalle has finally quantified the facts some of us have suspected all along. Preventive Maintenance is a killer investment. Yes!! 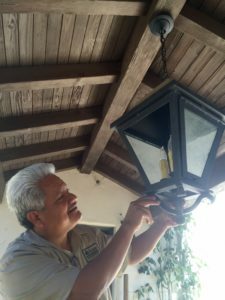 Preventive maintenance is not only a nicer way to own and care for a home…it makes money. The study showed that the money spent on preventive maintenance produced a whopping 545% ROI. The returns came solely from energy savings and extending the useful life of the equipment and infrastructure. 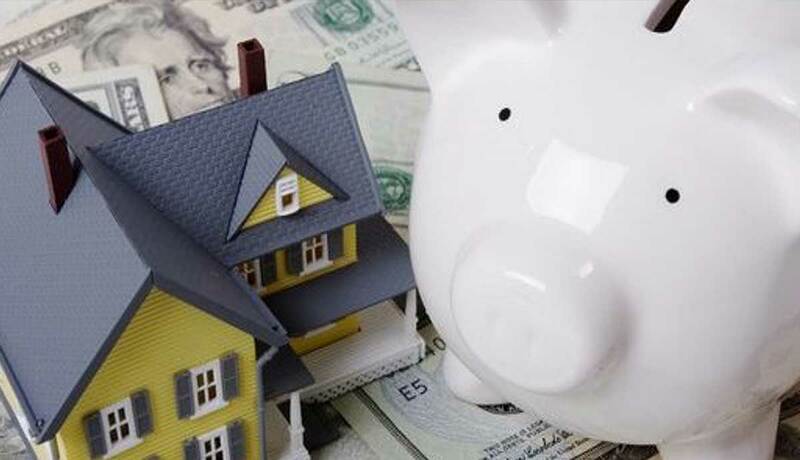 Any homeowner knows that those are not even attributes where the REAL value resides. The biggest values to most homeowners are in 1) disaster avoidance and 2) making the home more beautiful or fun to live in. What is the value in money saved if your water heater never floods your home? The 545% return would actually have been much higher still if it had been able to account for the very real value of the breakdowns, disasters and emergencies avoided. If you are a homeowner what are you waiting for? Start spending some money on maintenance and get rich… in comfort! These panels were used by the jillions to roof barns and other shelters are still in use today. Recycled examples with a nice layer of rust and patina are actually in high demand. I admire homeowners who choose metal roofs for value and durability. Be concerned though if your installer only offers a one-year guarantee on workmanship. A weak workmanship warranty is a red flag about the installer so check them out. A weak warranty is also at odds with metal roofing’s exceptional material warranties and durability. 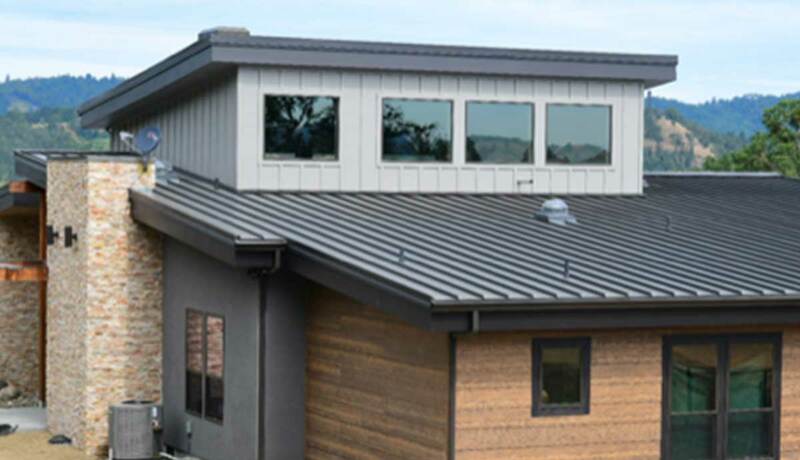 The industry’s Metal Roofing Alliance offers courses for metal roofing installers and contractors to make sure their work stands up to the durability of the metal material, and the test of time. By using proper installation practices your contractor should be offering workmanship guarantees that are more commensurate with a lifetime roofing material. An expensive metal roof can be ruined by using cheap or incompatible trim, fasteners, and accessories. Using galvanized materials or fasteners on a galvalume roof, for example, can cause irreparable corrosion and oxidation, compromising the quality of the panels and shortening a metal roof’s life. 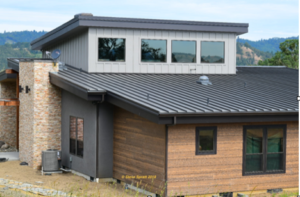 The cause is poor training, planning or laziness because it only costs a small amount more for the proper trim, fasteners, and accessories that are compatible with the metal roofing material. The long-term assurance of reduced call-backs… and even better, satisfied customers is well worth the trouble. Use roof flashings and curbs made from aluminum or stainless steel that are most compatible for metal roofs. Galvanized flashing is inferior, won’t last as long and can actually cause corrosion damage. If using galvalume flashing, minimize and check seam welding as this can melt the material’s protective coating. Use well thought-out flashings and under/over curbs. Make sure you plan for proper clearance in order to give water some room to run off and avoid pooling (a good rule of thumb is a minimum of 12 inches between panel ends and the diverter on the upslope end, and 6 inches between the curb’s sides and panel seams). For big curbs with a heavyweight load, be sure you have proper structural support underneath. Demand use of curbs around chimneys, caulking alone will not hold over time to prevent leaks. For metal roof plumbing penetrations, do not use standard residential pipe jacks or those made for membrane roofs. Use a pipe boots made to last, from galvalume or aluminum. Move the penetrations to miss panel seams and avoid blocking the flow of water. 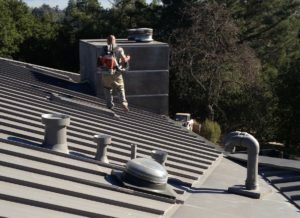 If other trades need to make penetrations in the roof (like HVAC), be sure they are supervised by the roofer and coordinate the location and method so that only proper techniques and materials designed for metal are used. Contractors with the proper training should be confident enough in their product to offer workmanship guarantees that make sense. The value of a fine metal roof deserves that.